Hello! I’m Kaitlyn, an illustrator and storyteller from Sonoma County, California, currently living in Indianapolis, Indiana. I love a good cup of black coffee, back scratches, the smell of lilac, and cooking messy (but delicious!) meals with my husband, Wes! When I was younger, I had big dreams of becoming an animator and character designer. I went to a summer program at CalArts, practicing character animation and making lifelong friends. After high school I attended multiple arts colleges, where I discovered that I was WAY more interested in children’s books, short stories, and fine art illustration! It goes without saying, but I love what I do. I’ve designed for a number of businesses including coffee shops, breweries, meaderies, etc. I’ve loved creating product for these types of businesses, because the projects always end up being lots and lots of fun! Once I got engaged, I decided to make my own wedding invitations. The feedback I got was wonderful. Never before had I considered designing wedding invitations for a living— but hey— life takes us on mysterious pathways to discover what we’re truly meant to do. I have found a way to do what I love and provide my clients with something that they’ll cherish for a lifetime. I’ve combined my love for the arts, my illustration abilities, and wedding industry to give you: Relics of Mona. The rest is history. Am I still creating illustrations and designing for clients outside of Relics of Mona? Yes, of course! I’m always drawing, doodling, printing, painting, participating in exhibits, festivals, you name it. You can keep up to date on my recent happenings/exhibitions through my Instagram. If you’re local, I hope to bump in to you sometime. If you’d like to say hello, please do! I love making new friends. I love to bake (and eat) sweets! As a child, the outdoor activity I looked forward to most was digging up pieces of obsidian at the local park. One of my all-time-favorite paintings is Fragonard’s “The Swing,” from the amazing art movement: Rococo. If you have gone through life this long and have yet to view Rococo paintings, google it immediately. You won’t regret it! 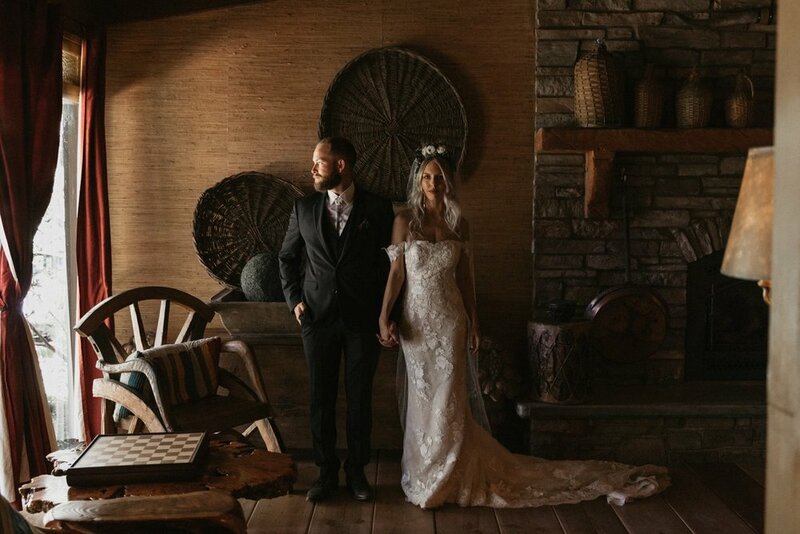 My husband Wes and I got married amidst redwood trees in my hometown and BOY was it the most fun-filled, loving, and exciting day of my life. What does Relics of Mona mean? Symbolism and ambiguity are important concepts in my work and are also reflected in my wedding designs. I like to think of wedding details as “Relics” that symbolize one of the most important days of your life. “Mona” translates to “valley of the moon”, which is a nod to my home in Sonoma County. Growing up amidst farmland and vineyards was bliss. Based on those memories, “Mona” represents the euphoria one experiences when being in a place they love surrounded by the people they love. My “Relic” is a stone raccoon figurine that belonged to my grandmother. I have vivid memories of myself as a child sitting on her bedroom floor, playing with the figurine while she watched some sort of murder news coverage (as usual). When she passed, I claimed one of her rings, a jewelry box, and that stone raccoon. It may be the strangest object I own, but it’s definitely the most precious. My grandmother is a major source of my inspiration. She was tough, intelligent and level-headed. She embodied what it meant to be a powerful woman. Channeling her spirit into my work has been my way of staying connected with her.